Poznań is assured by the City Transport Enterprise (MPK) in cooperation with City Transportation Office (ZTM) and also by several similar carriers in suburban municipalities surrounding Poznań. It’s easy see the difference between city and suburban bus lines because the route numbers on Poznań buses have two digit numbers and suburban operators have three digit numbers. The communication system uses the same tickets in three tariff zones, wherein the city is designated A, the nearest areas are designated B, and the most distant municipalities – C.
20 tram routes (excluding renovation periods) run through the city, these are complemented by over 50 bus routes, assuring transport from about 5:00 (on Sundays from about 6:30) to 23:00. Whereas at night (that is between 23:00 and 5:00, and on Sundays to 6:30), transport is provided on a single night tram route and by over 20 bus lines. The full list of all routes may be found on the internet site rozkładzie jazdy ZTM. There are three types of tickets used in Poznan. single-journey (irrespective of travel time, but without changing vehicle). The same prices apply equally on suburban and night transport services. However, especially good value paper tickets are those for 24, 48 and 72 hours. Furthermore: a 24-hour ticket punched in from Friday 20:00 to Saturday 24:00 is valid until midnight of Sunday to Monday! Single use electronic tickets.If you want to use the city transporation after arrival to Poznań you need to visit one of the ZTM client service points or go to one of the 200 ticket sales points (list here ) and buy a PEKA bearer's card for 27 PLN (of which 12 PLN as a deposit returned upon return of the card, and 15 PLN is the balance on one's account). We can also load the card for every amount of money. When travelling with a PEKA card whenever boarding or getting off a tram or bus you must place the card on a special orange card reader. The reader automatically subtracts the appropriate amount from your PEKA account. The price of the ticket in fact depends on the number of stops that are passed – the first stop costs the most (0.60 PLN), but each additional stop cost progressively less, until the 10th and further stops when the fare is fixed at 0.08 PLN for each successive stop. If we use the equivalent of the 24 hour ticket we do not have to pay anything else. Please note! When placing the card on the reader on boarding tram or bus it automatically deducts the equivalent of the journey from the specific stop to the end of the given line, but when placing the card on the reader again when leaving the tram or bus, the reader returns the unused money to the card. Furthermore one may change tram or bus three times and the number of stops is added together. It is important that: with one card several people may travel, simultaneously using a normal or discounted fare. When placing the bearer's card on the reader after boarding the vehicle one selects the tariff type (normal/concessionary) and the number of passenger for each of them. Main Railway/Bus Station -> Lake Malta – paper ticket: 4.60 PLN, PEKA 2.80 PLN. Stare Miasto -> Cathedral – paper ticket 3.00 PLN, PEKA 1.10 PLN. Stare Miasto -> Palmiarnia – paper ticket 4.60 PLN, PEKA 2.54 PLN. Period ticket – electronic. 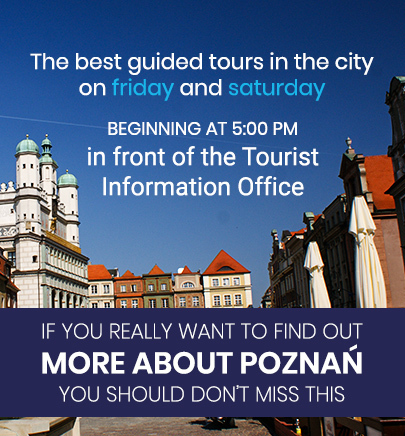 Recommended for those of you, who plan to stay in Poznań for a longer period (studies, scholarship, work etc.) – buy a PEKA card (with your own name – it is free! ), load the card (it may be loaded in the above mentioned places, or also via the Internet) for the chosen number of days from 14 to 366 and… It's ready! One may travel without placing the card on the readers. Where to find automatic ticket vending machines in Poznań (paper or electronic) – here you may find a list of appliances, and here a map showing the location of all ticket vending machines. The majority of night lines start from the vicinity of the main roundabout Rondo Kaponiera (in the western part of the city centre, next to the Main Station and the trade fair centre); Buses leave from different stops around Kaponiera every half an hour (generally at the final minutes 1:00 and 1:30). At night the same ticket prices and types apply as during the day. Ever more frequently suburban lines (some of them served by Poznań MPK, and some by municipality contractors) are managed by ZTM. This means that having a “Poznań" ticket one may equally travel beyond the city. We advise against using a car in the city – frequent road works, traffic jams, one-way street systems, which despite good road signs may be a challenge for drivers from outside Poznań, even with GPS Sat Nav, in particular in specific quarters, residential estates and areas with most important tourist attractions. The entire centre, together with adjacent streets is a Paid Parking Zone, and parking for several hours can cost quite a few PLN! The parking zone map, price list and zone regulations are to be found here. If you coming to Poznań and need a car only for few minutes you can use car sharing service. At the beginning of 2018 in Poznan operated 2 companies, which provide car to rent for minutes: https://www.traficar.pl and https://www.click2go.pl/. Those who prefer to be driven around the city can use the different varieties of taxi services on offer. Generally the rule is: it is almost always cheaper to use a radio taxi, ordering it by telephone. The list of corporation taxis (dryndi) is to be found here.